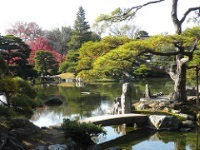 Built in 1645 by Prince Toshihito and considered to be the finest example of pure Japanese architecture and garden design, Katsura Rikyu is beautiful in its simplicity. The buildings are constructed of entirely natural materials and consist of a moon-viewing pavilion, an imperial hall, teahouse, and the wooden villa itself. The garden is designed for leisurely strolls with surprises around each corner, from stone bridges and lanterns to ponds and manicured trees. The grounds are particularly beautiful in the autumn, when the rich colours of the trees make for even better photos than usual. It is interesting to see how the imperial families lived and the Katsura Imperial Villa is one of the most popular attractions in Kyoto. The villa may be visited only on pre-arranged, guided tours organised by the Imperial Household Agency, with tours held each weekday, on Sundays and occasionally on Saturdays. Tours are in Japanese only, and can be arranged at the office of the Imperial Household Agency next to the Imperial Palace in central Kyoto. Foreigners will be given audio guides. The villa is closed between roughly 28 December and 4 January and for imperial functions. Be sure to take along your passport when you apply for a permit, and book at least a day in advance.